Fires in the Region – How Can You Help? Another natural disaster has hit the region. 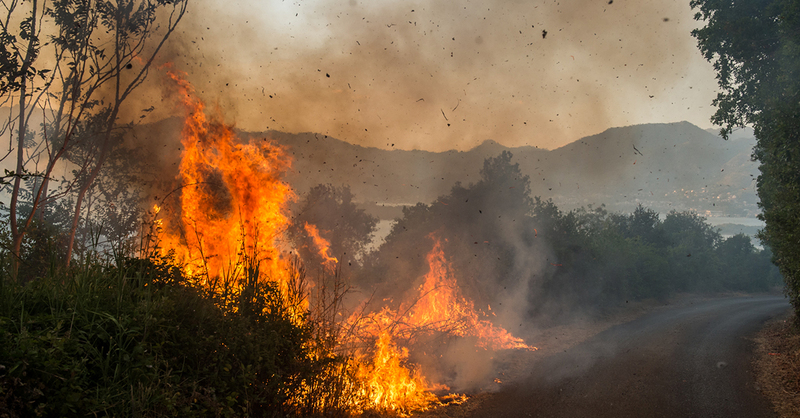 Wildfires across Montenegro and Croatia have forced evacuations. There are fires in Bosnia and Herzegovina as well, though not as dangerous. Many firefighters with the help of volunteers are fighting day and night. Some places are still at risk, but when they extinguish the fire, help is going to be needed – especially to those who have lost homes in the fire. There are not many opportunities to donate at this moment, but we believe that new bank and PayPal accounts will be announced in the coming days. So, how can you help? The blazes threatened Split and its outskirts, but they are now under control to a large extent. Several houses and barns, and a few cars were engulfed by the flames and damage will be later estimated. Around 80 people received medical treatment, and most of them were exhausted firefighters. There were no serious injuries. Croatian Red Cross took care of the people who were evacuated and temporarily situated them in the Spaladium Arena. Caritas, on the other hand, is collecting food and water for the firefighters. You can help them and donate the goods at 43 Zrinsko – Frankopanska Street in Split, or call +385 99 809 70 70. Kristina Karner and Branka Kraljik Runje, make-up artists from Slavonija, are organizing an unusual humanitarian event at the Split Riva – they will embellish passersby and raise funds for firefighters. Most of the fires in Montenegro are under control today, but the last few days were critical, especially in Luštica. Individuals are offering accommodation to families who had to flee their homes, as Miloš Samardžić did. There is already an official bank account for the help to the people of Cape Veslo in the Mortgage Bank. Everybody who wants to help can do that paying to this account: 520032000006305803, IBAN: ME25520036000002238296, SWIFT: HBBAMEPGXXX. We’ll update this page regularly with the new info on the ways you can help those endangered by the fires. Do you know of other ways to help? Please send us an email at info@catalystbalkans.org.